Types of Home Security Systems: Is Wireless or Hardwire Better for Your Home? So often I hear customers tell me they definitely want a “wireless” security system. Once I ask them a few questions it starts to become obvious that they talked with a security company that sells wireless security systems only. When you only offer a cookie cutter solution, you have to convince every customer that a wireless security system is better. Is it true? Well, many of the cable companies who are “bundling a security system” with your cable service and Internet only provide wireless security systems. Why? Systems shipped in a box for homeowners to install themselves are always wireless because homeowners are not equipped to install systems with any wires. So many of the DIY (do-it-yourself) security companies online have to convince you that a wireless security system is far better. Is it true? Many security companies, including ADT, want to increase profitability by selling security systems over the phone or online. Offering a wireless security system over the phone is less complicated. There is no need to send a Security Consultant out to help the customer see what is wired and spend the extra time helping them with hard-wired security options. So lots of customers are being convinced that a wireless security system is no doubt the best. Is it true? A wireless security system is often the best solution when your home does not have an existing security system and is not wired for a security system. If your home has an existing hard-wired security system or is pre-wired for security then a hard-wired security system is normally the best choice. Also, if you are building a home or doing major reconstruction down to the studs then a hard-wired system is your best choice. A hard-wired system does not have the capabilities of the modern day technology of a wireless security system. Completely false! A hard-wired security system can operate without a traditional standard phone line via cellular communication, it is able to communicate with wireless security devices and hard-wired security equipment and can have all the remote monitoring benefits from mobile devices that a wireless system has. When is it Best to Install a Hard-Wired Security System? It is interesting that 90% of custom homes and many of the production homes built today have a hardwired security system installed. So why do the wealthy and production builders still install hard-wired security systems? One of the main reasons is because they have the ability to run security wires while the home is being built. Security wiring is done after the electrical is pulled and right before the insulation and Sheetrock are installed. Door and window contacts are hidden inside the door jambs and window frames. You are not able to see the sensors when the doors or windows are closed giving you a more aesthetically pleasing look. Hard-wired security equipment is powered by the security panel and does not require batteries. Saving you time and money in battery replacement. 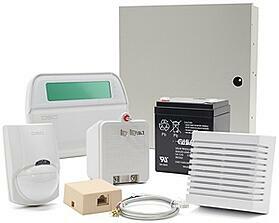 With wireless security systems you will have to occasionally replace batteries in each device. The security panel that communicates to the central station is separate from the keypad and is locked in a metal security system box providing an extra level of protection. With a wireless security system the control panel is built in the main keypad and may be more easily disabled. If you want to have one security system to secure multiple parts of your home separately you will need to install a hard-wired system. Example: Guest portion of the home is armed/disarmed independently from the main house. A hard wired security system can be integrated with home automation and audio/video systems with a RS232 Integration Module. Most wireless security systems have very little ability to integrate with other home management systems. In some cases with a very large home, 5,000+ square feet, wireless systems have a difficult time communicating to wireless devices that are extremely far from the main security panel or a wireless repeater. Hard-wired security systems can communicate with hard-wired security devices that are installed in the far corner of a large home. 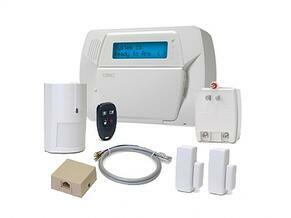 It is important to note that you can add wireless security devices to a hard-wired security system. If you want to install a security device where there is not a wire you have that option. These systems are called “Hybrid” security systems because they have the ability to communicate with both wireless and hard-wired security equipment. If you need help creating a plan and designing a security system solution that is right for you set up a free home security review. So When is a Wireless Security System the Right Solution? When you have a home where construction is completely finished and there is no existing wire, it is almost always the best solution to have a wireless security system installed. I personally have a wireless security system installed in my own home. I live in a home built in 1939 with plaster walls and drilling holes throughout my home was not something I wanted to do. It is nearly impossible to find a security company today that will run wire in an existing home. Drilling with 6 foot drill bits is a lost art. Years ago when hard-wired security systems were the only option, security companies accidentally put a lot more holes in walls, floors and ceilings. Not to mention electrical, gas lines and plumbing being hit by drill bits inside the walls. There is no need to run wires today in an existing home when wireless security is highly reliable and easily installed. If you have a simple security pre-wire with less than 8 zones, there are translators that can take the hard wired zone information and translate it to the wireless panel. This way you can have a wireless security system installed and use the wiring to doors, windows, motions and glassbreaks. The translator will not connect existing hard-wired keypads or hardwired smoke/heat detectors and can only connect a limited number of wired door/window contacts. You will probably need to have someone come out to take a look before you decide on this option. What if I Want to Add Cameras or Home Automation Devices with Remote Services…? You can add cameras and home automation to work with both wireless or hard-wired security systems. Most of these features are using WiFi and Z-Wave wireless technology to integrate video and home automation. Most systems have a hub or equipment built into the security control panel to communicate to different devices. The hub is normally connected to your Internet to send information to a cloud application giving you connectivity to your mobile devices. In many cases, the best choice is to have a Security Consultant come out to your home to go over all your security options. We find our most satisfied customers are often the ones who had an in-home security consultation and invested a little extra time to plan. They comment on how helpful is was to have a professional take a look at their property before deciding what kind a security system was right for their family.